Phuket Coral Island Tour on board Easy Day Thailand’s MV Sai Mai. Enjoy an amazing day tour to Coral Island and end the day with a delicious Sunset Dinner served on board. >> Get your Free Quote! Delicious Thai Set Menu Dinner served on board. Our cruises include accident insurance & tax. More images on our Cruise Gallery, Flickr and Facebook! 14.30 – Pick up from your hotel in Phuket Island and transfer by A/C minibus to Chalong Pier. 19.00 – MV Sai Mai is slowly cruising back to the pier at Chalong Bay. * Above Day Tour program & timing may be subject to change depending on suitability, sea & weather condition. 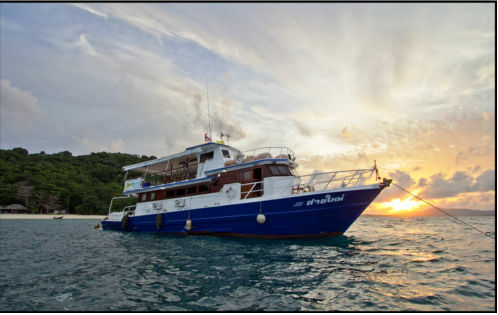 MV Sai Mai is owned by Easy Day Thailand and maintained with loving care over the years. MV Sai Mai is available for day charters and overnight trips to Phi Phi Island or Raya Islands and of course for private Dinner cruises. For more information about possible MV Sai Mai trips click here!